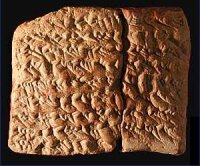 The Mesopotamians, and in particular the Babylonians, were one of the first civilisations to keep records of their astronomical observations. Because of this, they were also the first to notice a remarkable pattern: that eclipses of a particular type are repeated every 18 years, and more closely repeated every 54 years. If they saw a total eclipse followed some six months later by a small partial eclipse, then just over eighteen years later they would see another total eclipse followed by a small partial eclipse.The 18 year period became known as the Saros, and the 54 year one as the Triple Saros or Exeligmos. The cycles are no coincidence, and the terms are still used to this day. Every eclipse is said to belong to a Saros series, and each series is given a number. For instance, the annular eclipse of February 1999 belongs to Saros series 140, whilst the total eclipse of August 1999 belongs to series 145. At any point in time there will be around 42 Saros series in progress. The eclipses within any Saros series are not identical: the area they cover gradually migrates, each eclipse being centred slightly to the north or south of its predecessor. This gives a saros series a fixed life span, beginning as a minor eclipse near one of the poles, evolving cycle by cycle into a major eclipse spanning the equatorial regions, and eventually ending as another minor eclipse at the opposite pole. By convention, the odd numbered series begin near the north pole and migrate southwards whilst the even numbered ones move northwards from the south pole. The lifetime of a Saros, from pole to pole, is some 1400 years, during which it will produce between 69 and 86 eclipses. Saros 145 began in January 1639, and will end in April 3009. The cycles are caused by the interaction of three different types of month, and the 24 hour day. For a particular type of eclipse to be repeated the Moon must return to the same phase (full or new), the node line must again align with the Sun, and the Moon must be at the same distance from the Earth (so that its apparent size relative to the Sun is the same). The time taken for the Moon to complete one lunation (one cycle from new moon to new moon or full moon to full moon) is called the synodic month, and is 29.53 days. The draconic month (during which it revolves back to the same node) is 27.21 days. The time betwen consecutive perigees or apogees, the anomalistic month, is 27.56 days. You will probably have already spotted (!) that 223 synodic months = 242 draconic months = 239 anomalistic months. In other words, the three cycles will resynchronise after 6585.32 days - 18 years and about 12 days, the Saros period - and the eclipse will be repeated. The 0.32 part day means that the Earth will be rotated some 120° from its original position. For the eclipse to be visible from the same parts of the Earth, and at the same time of day, three such periods must pass, ie 54 years and 33 days, the Exeligmos. The most incredible aspect of this world spanning, long-term phenomenon is that it should have been discovered by a localised race nearly 3000 years ago. It is yet another demonstration that our ancestors were much smarter than we generally give them credit for.